1 3 November, 1983 Preschool Computing: What's Too Young? As its name implies, Family Computing was tailored to the home computing market. Articles would typically review educational software, games and home equipment such as Atari, Apple and Commodore products. Hey, it's Carson again almost 3 years later. :) I am wondering if the games and music in these magazines are in a D64 for download. I own the mags now but am unfortunately too busy to recode the games and music I typed in over 25 years ago. Feel free to email me. I would be interested in full scans (including ads) of this publication in a downloadable format. I remember renting copies from my junior high library at school and typing in the basic code for my brother's Tandy Color Computer. I would love to be able to find these mags again and type those programs in again. One thing though, was sometimes the magazine would print typos in the code and one letter/number off and it meant a big waste of time! Respond to this if you have any info. When computer magazines were springing up like daisywheels, I was subscribing to as many as I could. This was one of them, though it seemed to more fluff than anything else. I agree about K-Power and Joey Latimer... he wrote the best little BASIC toys and games. I really preferred K-Power to Family Computing, but I kept my subscription for years anyway. I have two old Joey Latimer/Family Computing books that we don't need. Any suggestion as to what to do with them? I'm putting a bunch of stuff on eBay today, including 3 books of programs from K-Power and Family Computing. I have a bunch of other vintage books going up. Keep an eye on http://ebay.sremick.net/ and keep checking, as I'm bound to find more. I know I have at least one whole boxful more of old computer books. Would someone please get Scholastic's permission and have someone put up a complete online archive for Family Computing and K Power? I'd LOVE to get my hands on the first four issues of K Power at least. Joey Latimer - DUDE, you rock! I typed in every one of your programs, but you really should have written Atari 8-bit versions of ALL of them. I'd have to honestly say that Joey Latimer could have been the inspiration for my career path! My dad used to bring home that Family Computing Magazines and I couldn't wait to type in the program so that I'd have a new game to play. I remember taking chunks of code from one program and putting them in another to my make own games. Awesome learning experience. I think it would be cool to take some of those games and bring them up to 2007 technology - I remember playing Santa's Landing a ton with my brother. Do you have the issue with Santa's Landing?? Thanks for bringing back some memories! I worked for the magazine think I have the whole collection in my attic. Do any of you remember the Programmer section or K-Power? I'm about to put a bunch of these up on Ebay, including most of the 1985 issues you don't have. UNABLE TO FIND THE LINK. 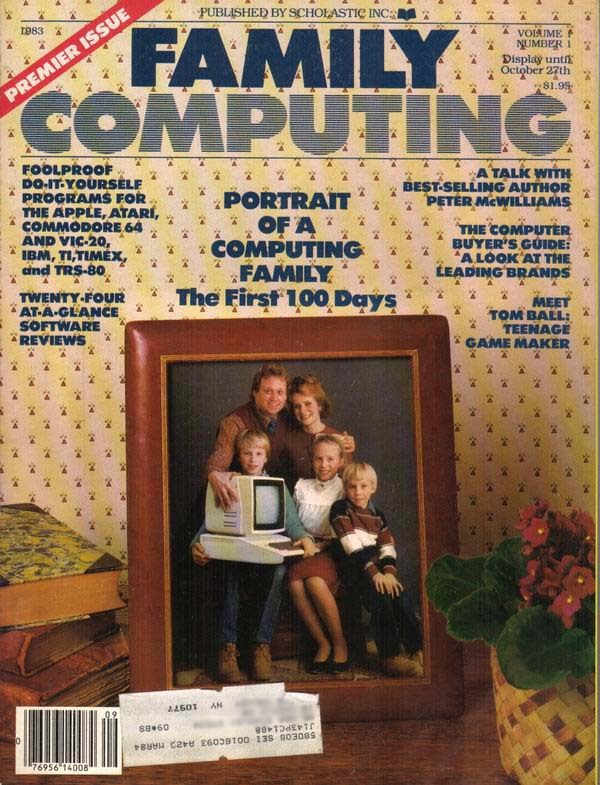 ANY MORE INFO ABOUT FAMILY COMPUTING MAGAZINE. If you're interested in ebaY, there's a guy selling 44 magazines of Family Computing for a very low price. Check him out! Here is the link.